Happy Wednesday, everyone! It is starting to feel like summer here in Vancouver. Very hot today but I'm not complaining. I made this card for a friend back in May. She wanted a few of some baby cards to have on hand to give away when a baby is born. I made her different ones so she doesn't have to give the same style card to different baby. This baby stamp set is retired and I love it very much. I used it a lot but I think it is time for a new baby stamp set. I like the new Baby Bundle stamp set in the new catalogue so it'll be in my next order. Yay! New stamp set is always nice! Thank you for visiting today. Have a wonderful day! Happy Tuesday, everyone! Here is a card I made using the Tropical Party stamp set. I got this set since it was available to buy and it was sitting there waiting for me to ink it up. I embossed the background paper using the Square Lattice Textured Impression Embossing Folder. The scallop behind the sentiment is the new 2-3/8" Scallop Circle Extra-Large punch. Love it! The only problem is that my 1-3/4" Circle punch is broken. I have to get another one if I want to make cards with this new scallop punch. Another item add to my ever growing wish list. Thank you for stopping and have a wonderful day. Happy 4th of July to all my American readers. Have a fabulous day! I love the fireworks in the US. They are so beautiful. 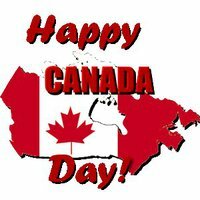 Wishing all the Canadian readers a wonderful Canada Day.